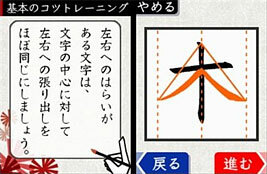 A training package to help improve the user's calligraphy when writing Japanese characters. Packaged with the Bimoji Bruch stylus, you hold the Nintendo DS like a book and are tasked with writing characters into the box provided. The game will highlight where you did well, and where your brushwork needs to be improved. You can take a daily training course or select your own character set to work on. You can also take the All Character Challenger, where you must write all 3099 characters available in the package.